Robert Kocharyan gives an interview to Alexander Lyubimov. The ways of transportation of the Caspian oil. It can be affected by the zone of the Nagorno-Karabakh conflict. Comparing the situation in Chechnya and Karabakh. How important to realistically assess the enemy, its resources and capabilities. Pros and cons of military cooperation with CIS countries. Possible support of foreign countries. The coincidence of the geopolitical interests of Russia and Armenia. The prevailing balance of power as a decisive factor in the cessation of hostilities between Armenia and Azerbaijan. Prospects for solving economic problems with the help of foreign countries. How long will the armed neutrality between Armenia and Azerbaijan, the theory of probability. Opinion on the work with Russian politicians. Returning to the discussion of the current economic situation in Armenia. Continuation of the interview (no sound for two minutes). Conduct parallels between Karabakh and Chechnya. 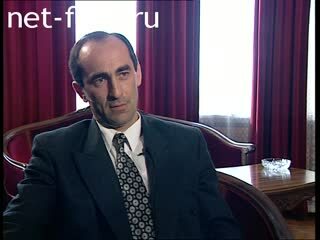 R. Kocharyan - Statesman and politician, 2nd President of the Republic of Armenia, the 1st president of the unrecognized Nagorno-Karabakh Republic. Lyubimov AM - Journalist, producer, broadcaster, vice president of the Russian Television Academy.